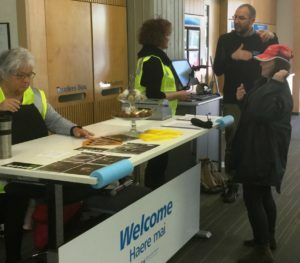 We welcome deafblind and whānau/friends to regular meetings. You’re invited to afternoon tea at Amanda’s, Tuesday, 2 October, at 2 p.m. Enjoy the Nelson sunshine, good food, and conversation with your peers. Family/whānau and friends welcome! Brian will bring his Daisy Player. If you want a hand with yours, bring it along. 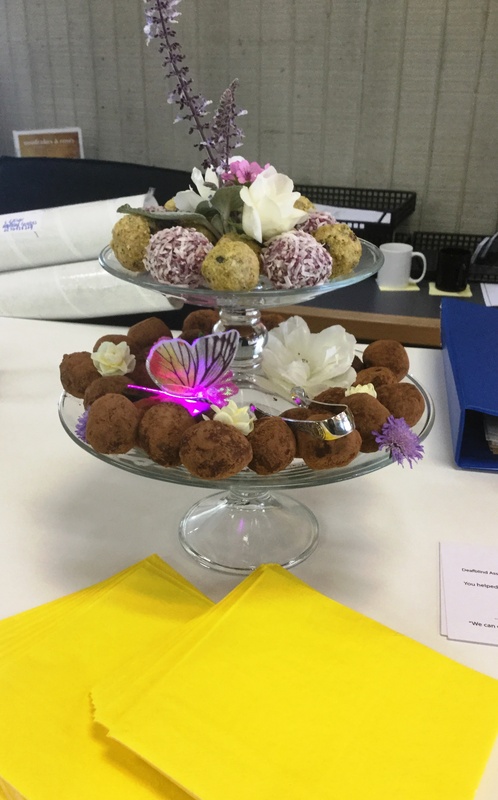 Tomorrow we will spend a couple of hours in the entryway of Nelson City Council, serving truffles from Melrose House and information about deafblind to anyone coming into the NCC offices. 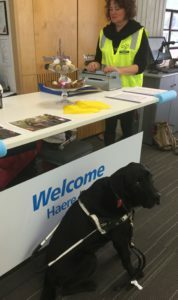 The staff at the Council have been most helpful in arranging their foyer to suit both their customers and those interested in learning about deafblindness. Our next meeting is Wednesday, 30 May at 2:30p.m. Please call or email to find out the venue. We will be showing high vis vests with our new logo on the front as well as our website on the back with the word deafblind in larger print. We will also share ideas about how to strengthen volunteer driving opportunities in our area, including police checks for volunteers. 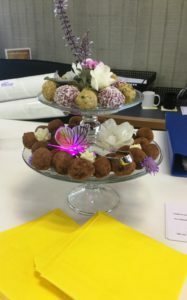 Afternoon tea is a must of course and Amanda will demonstrate Alexa, a new voice operated device. 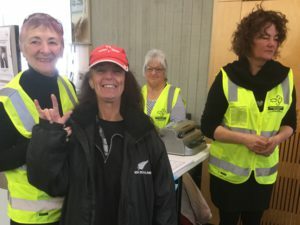 Our meeting on Wednesday was attended by 13 deafblind, support people, and whanau. The vests were modelled and comments were around their usefulness. “Alexa” was demonstrated with some wanting more information. Kaye Ellison, Deafblind Coordinator, Blind Foundation, also demonstrated the minicom system, meeting some who identify as deafblind where they had not been known to each other before. We hope good support will come of this! When all the gadgets had been investigated we had a good ol’ chat and tucked into the home baked afghan biscuits and peanut brownies – thank you Peter – fruit from Kaye, and cameo creams donated by an “unknown kind person”. We’ll keep you posted about what’s happening here in Nelson regarding Helen Keller Day on 27 June.